Enjoy modern accommodations with free breakfast and free parking for excellent prices at La Quinta Inn & Suites San Diego Mission Bay. It's so close to the attractions you can almost hear whales splashing lions roaring and waves crashing. La Quinta Inn & Suites features 88 rooms on four floors each with either a king bed or two queen beds cable TV with premium channels. There's a business center a heated pool and a hot tub as well as a daily hearty breakfast free each morning. The hotel also has a guest laundry and parking is available for an additional fee. 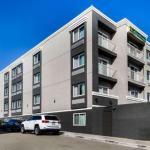 Located five miles from San Diego Airport La Quinta Inn & Suites is in the Pacific Beach neighborhood just steps from six restaurants one mile from a shopping center a half-mile from Mission Bay Golf Course and beaches three miles from SeaWorld and six miles from the San Diego Zoo. Dogs of all sizes are allowed. Dogs may not be left alone in the room.